Once upon a time there were two brothers living in Barcelona: Alfredo Valles and Andres Valles. They built a company, Servicevision, one of the largest rental companies in Spain. But what they really loved to do was build lenses. And they did: Scorpiolens Anamorphics. Scorpiolens screenings will be held Saturday June 7 during Cine Gear in the Paramount Theatre from 10:15 – 11:15 am and from 3:15 – 4:15 pm. 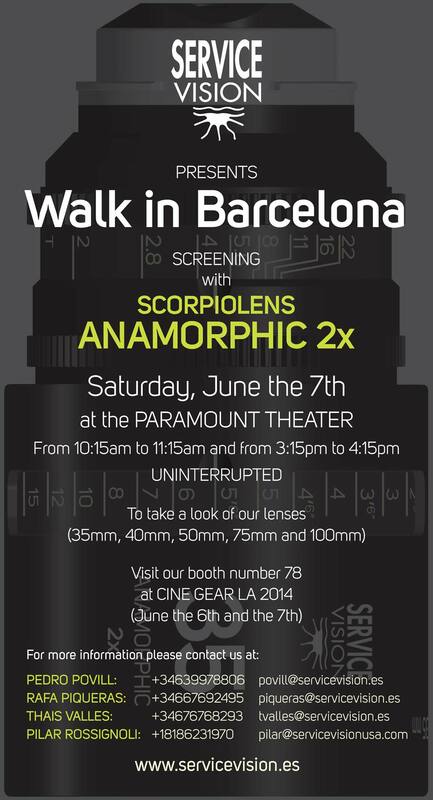 Pedro Povill said, “To show an example of how you see the world through Scorpiolens, we are glad to invite Cine Gear attendees to the screening “Walk in Barcelona,” done with the initial prototypes of the 100 mm and the 75 mm, and the preproduction unit of the 35 mm. In this screening, we want to show you the anamorphic quality of our lenses, the warm look with definition, without breathing, and respecting the linearity (lack of distortion) even using 35 mm. Please enjoy the screening. Andres and Alfredo will receive the Cine Gear Lifetime Technical Achievement Award on June 6 at the annual awards event on the Paramount lot. Here’s a Special Report reprint about the Brothers Valles, the company, and their latest Scorpiolens Anamorphics. Servicevision will present preproduction units of the basic set of Scorpiolens Anamorphic 2x lenses (35mm, 40mm, 50mm, 75mm and 100mm)at Cine Gear LA 2014 in their booth 78 The Scorpiolens Anamorphic lenses will also be shown at their Cine Gear LA booth 78 (right next to Film and Digital Times). They will also show the New Scorpio Stabilized Head mounted on a Scorpio Arm, along with other Scorpio products.